and to celebrate, we’ve invited Dr. Steven Daviss to talk about how he used Google Docs to write a book with two colleagues. Dr. Daviss is currently the Chairman of Psychiatry at Baltimore Washington Medical Center in Maryland and has been increasingly leveraging his clinical and administrative experience towards a career merging health care policy, informatics, and health care reform. 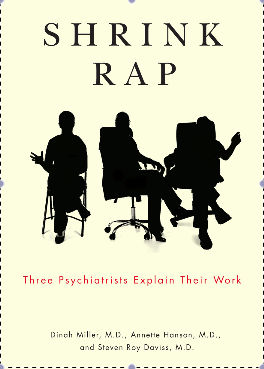 Two other psychiatrists (Anne Hanson and Dinah Miller) and I have been writing a popular blog (Shrink Rap) about the practice of psychiatry since 2006. A year later, we started a podcast (My Three Shrinks) that has received great reviews in iTunes. Late in 2007, we decided to take some of those posts and weave them together to write a book. After several weeks of this, we were all seeing red, which was causing a lot of unnecessary tension. I had used Google Docs collaboratively before to write a couple articles and a few grant proposals, but wasn’t sure if we could successfully use it to write an entire 250-plus page book. But I knew it had to be better than what we were doing. Once we switched to Google Docs, writing the book together became a much more fluid process because we were able to focus on the writing and not on the complications of getting the technology to keep up with us. We imported the first couple chapters and proceeded from there, making each chapter a separate document shared by the three of us and (eventually) our editor. We could write our own chapters privately until they were ready to show our co-authors, then sharing was as simple as clicking a couple buttons. Whenever we changed our minds about what to take out, we were able to restore sections from previously saved versions. We didn’t have to think about which version of word processing software someone was using, or if the documents would lose formatting between Mac and Windows. And, I could see when my co-authors were also working on the book, so I knew when to call and talk about the project. Eighteen months after getting the book contract, we had a completed manuscript ready for copy editing. Google Docs also helped to save our relationship. Initially, despite being good friends, the three of us had many conflicts about the technology and about the way we wanted to write (e.g., grammar, tense, tone, characters). When we were using emailed versions of documents, our arguments increased. After switching to Google Docs, we went back to our usual level of bickering ;-). The book is being typeset now by Johns Hopkins University Press and will be out in May of 2011. And we have Google Docs to thank. Guest post: November is National Writing Month and to celebrate, we’ve invited Dr. Steven Daviss to talk about how he used Google Docs to write a book with two colleagues. Dr. Daviss is currently the Chairman of Psychiatry at Baltimore Washington Medical Center in Maryland and has been increasingly leveraging his clinical and administrative experience towards a career merging health care policy, informatics, and health care reform.